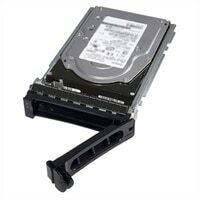 Dell 2.4TB 10K RPM Self-Encrypting SAS 12Gbps 512e 2.5in Hot-plug Drive 3.5in Hybrid Carrier FIPS 140Increase the storage capacity of your system with the 2.4 TB Hard Drive from Dell. Offering a rotational speed of 10,000 RPM, this drive provides fast disk access. Featuring SAS interface, this hard drive delivers enhanced data transfer speeds. Increase the storage capacity of your system with the 2.4 TB Hard Drive from Dell. Offering a rotational speed of 10,000 RPM, this drive provides fast disk access. Featuring SAS interface, this hard drive delivers enhanced data transfer speeds.